Equality and Diversity UK is a specialist training company focusing on equality and diversity in the private, public and voluntary sectors. We provide training courses, seminars, resources and we run the Equality and Diversity Network. If you are an organisation looking to improve your image or extend your workforce to make it more diverse then contact us and we will provide you with a free initial assessment of your organisation's needs and tailor‑make any training or consultancy to match and fit your context and organisational culture. 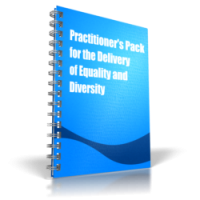 As well as our off the shelf range of training resources, we can design and produce bespoke resources for your organisation, including help with equality policies and impact assessments.